Flaghouse, Bedroom is a lifesize recreation of a room from a small-scale sculpture I built in 2007. Commissioned by and shown at the di Rosa in Napa, CA, the room has wood paneling, green shag carpet, a retro video game rewired with Space Invaders and Tron video, a tv playing wresting, heavy metal, monster truck racing, and Cops, two bongs, bikini posters on the wall, and 1980's Playboys, with lotion and tissue. Part of the mural from the small-scale sculpture is painted on the outside wall. 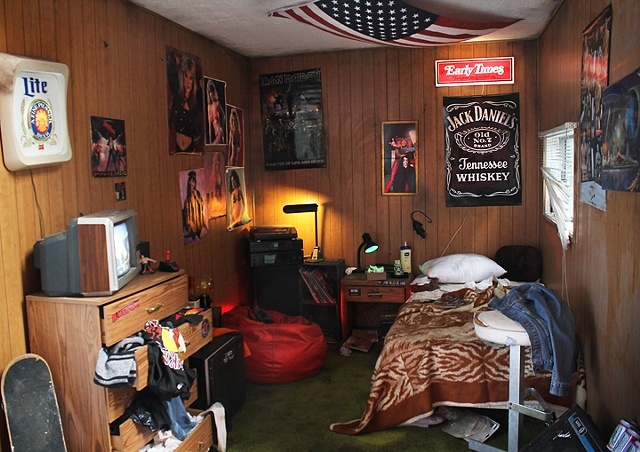 The room resembles some friends' brothers' rooms and a boyfriend's room that I saw as a teen.